Conveniently located just 700 metres from BTS-Sapan Kwai and 1.2 km from Chatuchak Weekend Markets, the elegant Elizabeth Hotel boasts an outdoor pool, a sun terrace, and a restaurant open for all-day dining. During the stay, guests have an access to free WiFi. Featuring city views of Bangkok, each cosy guestroom at Hotel Elizabeth is appointed with air conditioning, a TV, and a desk. Guests can find a well-stocked minibar in every unit. 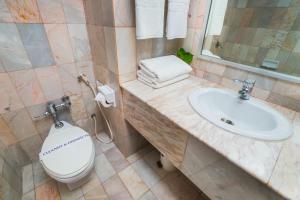 All rooms include a marble bathroom supplied with a bathtub and free toiletries. Elizabeth Hotel provides a 24-hour front desk, a laundry service and a shared lounge. A meeting facilities and fax/photocopying are available as well. This hotel has free parking space. 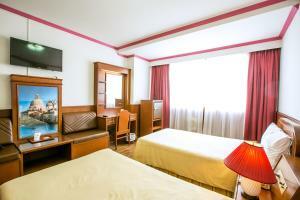 This hotel is 4.6 km from Platinum Mall and 6.2 km from the renowned Khao San Road. For flights, head to Don Muang Airport (16 km) or Suvarnabhumi Airport (30 km). Guests can enjoy Thai and international specialties at the in-house restaurant and bar. Being located in a residential area, the neighbourhood of the hotel is full of dining outlets and a variety street food vendors. Offering city views, this twin room is appointed with air conditioning, a TV, and a minibar. 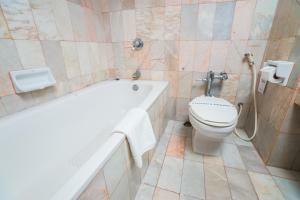 Its marble bathroom is supplied with a bathtub and free toiletries. This single room is complete with a desk, a TV and a minibar. 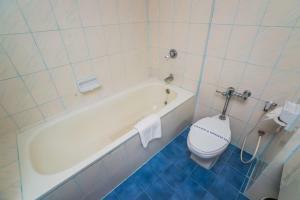 Guests can enjoy a bath in the en suite bathroom. Rate: THB 1250.00 ... THB 2900.00; select dates below to get current rates. This suite has air conditioning, dining area and minibar.